The Coca-Cola Company has decided to discontinue sales of Coca-Cola Light in Russia and brings to the domestic market another low-calorie drink – the international brand Coca-Cola Zero. The company hopes that this will increase Russian sales of the entire Coca-Cola brand, which effectively failed to grow during the past year for the first time since 2010. The Coca-Cola Company has started selling the drink Coca-Cola Zero in Russia, the American company's Russian office told business daily Kommersant. The report was confirmed by several retailers. However, the company’s sugar-free soft drink Coca-Cola Light will no longer be produced in Russia, Coca-Cola spokesman Vladimir Kravtsov said. A source from the Dixy Group of Companies (which owns Russian grocery chains Dixy and Victoria) said that remaining stocks of Coca-Cola Light are now being sold off, while the new product has been available for several days already. Coca-Cola Zero first appeared on the U.S. market in 2005 and is now sold in 160 countries. The cost of Zero as a brand, according to the company's estimates, exceeds $1 billion (the entire Coca-Cola umbrella brand was estimated in 2014 by the brand consulting group Interbrand at $81.6 billion). Coca-Cola Light (originally known as Diet Coke, a name still in use in many markets) was launched in 1982, and sales in Russia began in 2000. Both Coca-Cola Light and Coca-Cola Zero are positioned as calorie-free. "The difference is in taste: Zero is as close as possible to the original Coca-Cola, which was confirmed by 75 percent of respondents in the preliminary tests," said Kravtsov. Both Dixy and Metro Cash & Carry noted that sales of Coca-Cola Light in the stores of these chains are negligible. "Consumption of low-calorie foods is not yet so widespread in Russia," Metro spokeswoman Oxana Tokareva said. However, Coca-Cola pointed out that the situation is changing, referring to a study by global information and measurement company Nielsen: In the third quarter of 2014, 82 percent of Russian consumers confirmed that the amount of calories consumed in foods was important to them. It also follows from the study that the consumption of low-fat milk has grown by 10 percent since 2012, cottage cheese (tvorog) by 31 percent, and cheese by 72 percent. Coca-Cola hopes that replacing its Light brand with Zero will have a positive impact on sales of its main brand in Russia, but do not specify the forecast numbers. "In 2014, the share of Light in total Russian sales was 2 percent," said Kravtsov. "By 2018, we expect that the share of Zero will increase to 10 percent." However, this still represents a very low share of the market for low-calorie products compared to that seen in large Western markets. For example, in the UK, the share of low-calorie cola in the total sales of the brand, according to the company, is 43 percent. 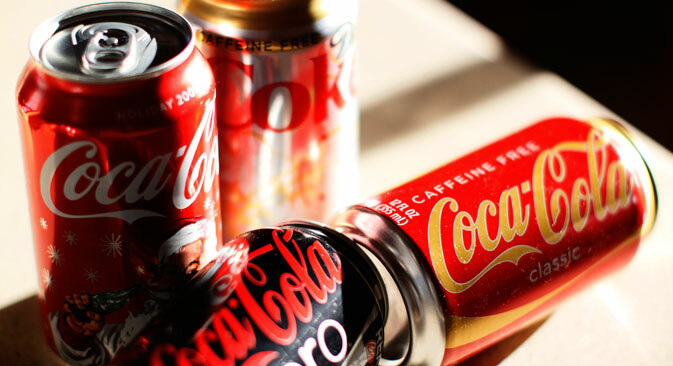 In the United States, according to a report by Coca-Cola Enterprises Inc., sales of standard Coca-Cola decreased by 1 percent in the past year, while Coca-Cola Zero showed an increase of 11 percent. Coca-Cola's main competitor PepsiCo, meanwhile, has two low-calorie drinks in the Pepsi brand's Russian portfolio – Pepsi Light and Pepsi Max. "According to our estimates, the majority of consumers prefer the classic taste of [our] cola; Pepsi Light and Pepsi Max occupy less than 10 percent in sales volume of the brand Pepsi in Russia," the Russian office of PepsiCo said. According to market research by Canadean, sales of drinks under the Coca-Cola brand in Russia have increased four times over in the past 15 years – from 211.8 million liters in 2000 to 859.1 million liters in 2014 (the market share of carbonated soft drinks has increased accordingly from 9 percent to 18.5 percent in the same period). Meanwhile, last year Russian sales of the drink effectively failed to increase for the first time since 2010 – growth was only 1.1 percent. For comparison, the increase was 19.6 percent in 2012 and 10.3 percent in 2013. The report published by The Coca-Cola Company for the first quarter of 2015 said that its overall sales in Russia decreased by 7-8 percent (“high single-digit”) in real terms during this period. Zero will be present in all the company’s promotional campaigns, along with the main brand, Coca-Cola said. Specific numbers concerning investments in promotion were not disclosed, but the company noted that the advertising budget of the entire Coca-Cola brand is always directly tied to the revenue that its sales generate in a particular region. According to AdIndex, the total budget of the advertising campaign in Russia amounted to 2.9 billion rubles in 2014, of which 2.7 billion rubles was spent on television advertising.